Boulevard Supply is a supplier of crowd control stanchions, traffic cones, barricades, channelizers, delineators and various other traffic control equipment to cities, municipalities, counties and state Departments of Transportation. This includes safety services such as police and fire rescue. We have even sold traffic cones to the BLM. From city hall parking lot to all the road maintenance and repairs being performed by city, county and state workers, safety is priority and traffic cones are a necessity. 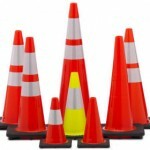 We have access to all the sizes of traffic cones, orange barrels, channelizers and delineators you need to safely perform your job. Do you need Type 1 and Type 2 barricades with flashers? Orange barrels? We will ship directly to your garage. Government facilities including city hall can get congested for some meetings and events. Maintain and keep control of the crowds with our stanchions and crowd control barricades.